ECHO emphasizes the many benefits of growing perennial vegetables. By this we mean vegetables that are planted once and eaten from for years. The benefits are many and can be especially helpful to the families of PLWHA, who have diminished labor availability and perhaps less land and money to purchase seeds. Perennial vegetables require far less labor and expense and usually can be counted on for a reliable yield of food. The typical garden must be dug or plowed, then further worked to make a fine-textured seed bed. Farmers are often unsure whether they will find the seeds they want, whether they will be good seeds, and how far they may need to travel to purchase them. Then there is the work of planting the seeds and cultivating out the weeds. Ants and birds may eat the seeds. Chickens may eat or scratch out the young seedlings. 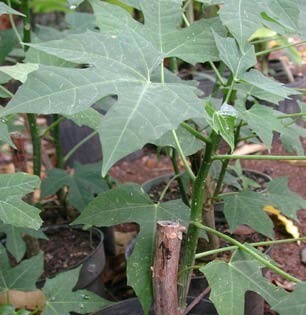 Cutworms may cut the stems of the seedlings and insects may eat the leaves. Larger farm animals can destroy the garden. In contrast, once a perennial vegetable has reached a considerable size, nearly all of these problems disappear, except those caused by the largest farm animals. This is especially important for the sick and elderly, including AIDS patients and AIDS orphans. Perennial vegetables provide food year after year. I planted two of my favorite perennial vegetables, katuk and chaya, when my wife and I built a new home 22 years ago. We are still eating from the same plants today. Chaya is a favorite perennial vegetable at ECHO. Soil erosion is reduced. Because there is no need to till the soil, soil erosion is reduced. This can be of enormous importance on sloping land. Perennial vegetables have special disease and insect resistance. Almost by definition, perennial vegetable plants must have unusual ability to fight off plant diseases and insects, or they would never live enough years to become perennials. Perennial vegetables have resistance to climatic extremes. Again almost by definition, perennial vegetables must be able to survive long periods without rain if they are grown in a drought-prone region and to resist heat and humidity if they are grown in the hot, humid lowlands. Perennial vegetables often have high nutritional value, high yields and provide food over an extended season. I am always struck by the enormous quantity of edible green leaves on a chaya bush, compared to the much smaller amount that can be harvested from an annual leafy vegetable like spinach or lettuce, which would take up the same space in the garden. I have seen chaya producing edible leaves in Haiti after four months without rain. An added benefit is that leaves of the perennial vegetables regrow soon after harvesting. Favorite nutritious perennial vegetables at ECHO include moringa, chaya, katuk, and Haitian basket vine (also known as "hoop vine"). Write or visit our website for more information about these and other perennial vegetables.